North Orlando – Manatees again! Yesterday I took my 3rd trip in the last two months up to Blue Springs Park in Orange City. It was a pretty cool day so I knew there would be at least a few. 52 was the count yesterday. Lots of people were around to view this spectacular place. 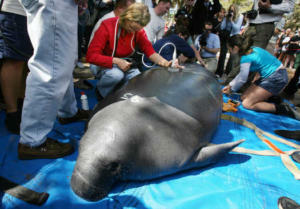 The manatees come into the springs when the ocean gets too cold. They come in via the St. John’s River. One manatee we saw had a monitoring system attached to him. “Bock” was grown in captivity and was just released into the spring last week. He was huge, weighing in at 1,000 lbs! Blue Springs Park is a wonderfully historic place, and it is only 30 minutes north from Thurston House…well worth the ride! We had a very nice visit with friends Bob & Sadie Friday night. This happily retired couple live in Utah and were visiting their Disney timeshare. Lots of catching up to do! Recently a new mascott has been added to our porch – Baby-Beek! When the wind is just right, Baby Beek flaps it’s wings and sparkles with wacky motion…very cute! Come to Thurston House to see for yourselves!